Take a good look before the station loses its mustard facade, its fifth colour over the building's long history. The current plan to refurbish Flinders Street Station is a good start. But is it enough? For nearly a decade Melbournians have witnessed three successive Victorian Premiers declare their heartfelt commitment to saving the city’s beleaguered French Renaissance suburban rail terminus. This is hardly surprising, given the amount of popular pressure there has been to invest in a building that has a unique place in Melbourne’s history and its sense of civic pride. There have been submissions from the National Trust, front page declarations from the press and an international design competition, each in turn urging, demanding and proposing improvements to the aging station and its operations. The station is not simply a heritage concern. It is at the heart of the city’s functioning transport system. Much of the public conversation has tended to focus, perhaps rightly, on its heritage value. The fabric of the building does urgently need protection. However it should not be forgotten that this is also a major piece of urban infrastructure. Approximately 100,000 people pass through the station every weekday, making an important contribution to Melbourne’s economy and global competitiveness. The station is not simply a heritage concern. It is at the heart of the city’s functioning transport system. 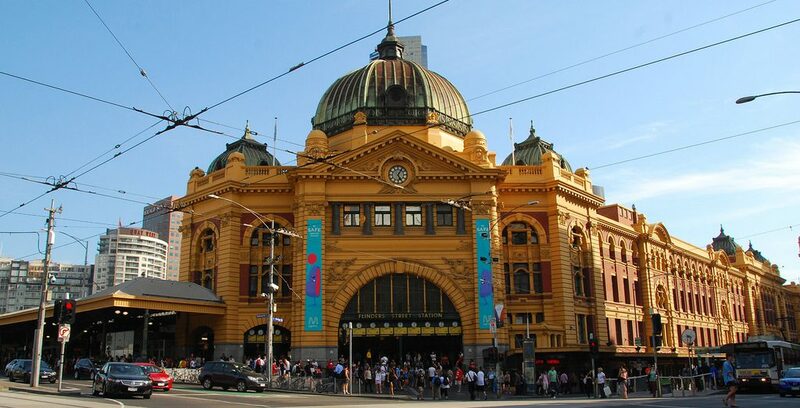 On 30 January all this public conversation would appear to have yielded results, as the Minister for Public Transport announced work would commence that very day, ‘to save and clean up’ Melbourne’s Flinders Street Station. 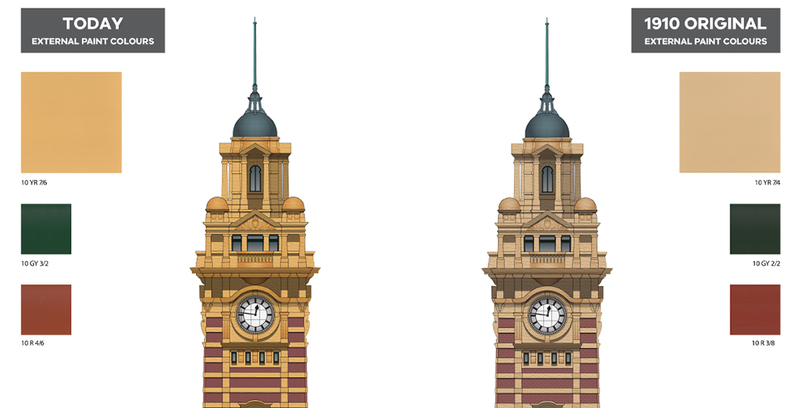 ‘From this evening, scaffolding will start being installed on Flinders Street at the western end of the Administration Building, to enable extensive restoration works’. This round of works is part of a larger $100 million investment in the station that will take some years. For now, from a heritage perspective, the station façade is being repaired and painted, made structurally sound and watertight. Operationally the station will undergo number of improvements, including an extended concourse along Swanston Street, with new entrances at the western end of the station near Elizabeth Street, and in the Degraves Subway. In addition, the main entrance on the corner of Swanston Street will be redesigned to make it easier to get in and out, while ticketing services will be revamped across the station to allow people to get through the gates faster. Refurbishments are also either complete or underway to improve toilets and lighting. Taken together however, there remains a question as to whether all this is enough. Each of these refurbishment initiatives are welcome and undoubtedly represent a priority list of urgent tasks. Taken together however, there remains a question as to whether all this is enough. To answer this question, it is salient to consider the 2011-13 design competition, which as a $2 million exercise that spanned two years, remains the most expensive ideas competition Australia has ever conducted. Caricatured by the current state government as unfunded and a ‘colouring-in exercise’, the competition brief ran to 68 pages and was drafted in consultation with the Department of Transport, Heritage Victoria, the City of Melbourne and the Office of the Victorian Government Architect. Whatever the virtues of individual competitor submissions, the brief arguably forms one of the more comprehensive overviews of the challenges facing the station; from its multiple transport and heritage needs to its urban design challenges (at 560m long the station forms a substantial physical barrier between the city and a riverfront that has been heavily invested in over recent years). Front and centre in the competition brief was a need to substantially improve passenger flow. The brief noted, ‘Passenger movement numbers are forecast to grow significantly in the years ahead as Melbourne’s population continues to grow’. Public Transport figures vindicate this assertion, with weekday passengers rising from 2009 to 2012 (the most recent available figures) by over 9 percent. Applying this percentage to figures from now til 2021, just four years away, passenger figures are likely to rise by another 20,000 during week days. Given the city’s continuing population growth and the completion of the Melbourne Metro in 2026, it is conceivable that the already high peak passenger numbers will double by 2030. This will require more than the optimising of the existing circulation and station entries. It will require a substantial rethinking of entry and egress provisions, additional ticket booths, extended platforms and even the possible reopening of the retired platform 11 (now one of the city’s more linear outdoor bars). For this reason, it was perhaps not unreasonable that the 2011-13 competition encouraged competitors to comprehensively rethink the way the station worked and how it stitched into the urban landscape of Melbourne. There is no reason why this could not be done, while also respecting the station’s core heritage value. No reason bar one: cost. In reviewing the current $100 million investment, we can see that in place of an ambitious rethinking of pedestrian flows, circulation and holistic rethinking of the station, the current plan is limited effectively to: better signage, faster myki readers and a de-cluttered forecourt to allow greater flow of passengers. “We have never thought that Flinders Street Station had a design problem”, says the Transport Minister Spokesperson. When asked whether the current plan had been able to learn anything from the past competition, a spokesperson from the Minister of Public Transport’s office couldn’t have been more categorical. ‘We have never thought that Flinders Street Station had a design problem. That was something that the former government believed. It’s an absolutely beautiful building and it has been a part of our history and it should be part of our future as well. We don’t believe we need to redesign it’. Yet one of the defining characteristic of contemporary heritage conservation is the need for most important historical buildings in our cities to be adapted to meet new challenges, new needs and functions, much of which did not even exist a century ago. A station that opened to the sound of steam engines and the clip clop of Cobb & Co carriages, handling a fraction of today’s passengers, simply cannot function without a root and branch review of its functionality. This much is understood in cities all over the world. Witness the billion pound reinvention of London’s Kings Cross station, or similar plans to overhaul and adapt Gare du Nord in Paris and Penn Station in New York, all conceived as sensitive to the existing heritage of each station, while also giving an entirely new lease of life to these icons of architectural heritage. Meanwhile it is notable that a proposal apparently driven by a respect for the important heritage features of the station, is almost entirely limited to its outer envelope. The façade is to be repaired, made structurally safe and waterproof. Meanwhile the entire top floor interior, once as luxurious as a five star hotel, and featuring an elegant ballroom, will remain unused, unusable and untouched. The flaking heritage plaster will continue to flake and the opportunities to transform over half a kilometer of heritage building into a new public space for the city must sit on ice. As the minister’s office noted, ‘You can have all the plans in the world for what you want to do with the ballroom but while it is leaking it is always going to be degrading.’ There is no question that the building needs to have a functioning roof. But that fact is no excuse to otherwise abandon the station’s extraordinary heritage interiors, which hold such historical importance for the city. Rather disingenuously it is also claimed that the administration building ‘is being used by Metro Trains Melbourne so the train operators have lots of offices that they work out of there.’ While this is true, the office spaces are significantly degraded and dingy, and it is questionable that such an enormous volume of space, in such a prime inner urban location, is best used to accommodate transport logistics and administration. As the scaffolding begins to cover Flinders Street Station, Melburnians will feel some relief that further damage will not be inflicted on this much-loved building. The state government should be commended for finally getting on with urgent and immediately necessary work: fixing a leaky roof, giving it a lick of paint and de-cluttering the forecourt’s ad hoc mess of retail and ticketing. However, claims that this constitutes either a ‘major restoration’’ or will ‘return this grand old dame to its former glory’ are sadly very far off the mark. What will the footpath of the future look like?